Hope's Cafe: No-Name Steaks Review!! Hey everyone, I have a wonderful company to share with you today. If you have never tasted a No-Name Steak, then you are seriously missing out! I had seen these steaks in grocery stores before, but never tried them. Now I wish I had! I received a package in the mail that contained some coupons, and a "tastefully" wrapped t-shirt. I seriously thought this was a steak at first! 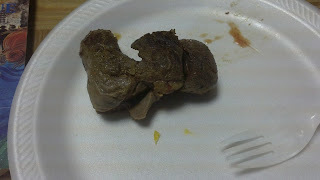 I found the No-Name steaks at a SuperTarget, and went with the Petite Cut Steaks. The steaks are individually sealed in plastic packages, so if you only need one or two steaks, you don't have to re-wrap the extras. I usually add my own seasoning or marinade, but the box said that these had already been marinaded. So, I simply added some onion and cooked them up in our electric skillet. Cooking the frozen steaks only took about 15-20 minutes, for a medium to medium-well steak. It's a little blurry, but this is me cooking my No-Name Steaks...in my No-Name Steaks t-shirt! When I took the first bite, I could not believe how tasty they were! Very tender, and seasoned just right! I think everyone who tasted them commented on both the flavor and tenderness of the meat. No-Name Steaks will definitely be purchased again in our home! So, if you're looking for a fast easy way to serve your family some tasty steaks, you need to check your local grocery store for No-Name Steaks. Or, check the store locator on their website to find your closest place to buy! And, by the way, No-Name also offers chicken, seafood and other meats. Keep and eye out for a review of their chicken and seafood coming soon! "Over thirty-five years ago, in a small neighborhood butcher shop, a local butcher began selling delicious, hand-cut steaks. These steaks cooked up tender and juicy and, as rumor had it, tasted incredible. Word began to spread. When his customers asked the butcher what these steaks were called, he simply replied, "They don't have a name." Soon, people were coming from miles around to get the steaks with "No Name," and a legend was born. Fast forward to today. No Name® still is famous for steaks, but now No Name® has also become synonymous with quality dinners for all sorts of tastes. No matter what you're in the mood for, you know it will be delicious, guaranteed. Look for all the varieties in your grocer's frozen meat section." Disclaimer: I was not monetarily compensated in any way for this review. I did receive product for the purpose of review. All thoughts and opinions are mine. All quotes taken from the No Name website. I think that we will try these time next time we go grocery shopping. They look good!